Vedder steps up for trails. Register today to avoid late fees and enter a drawing for a free bike at spokefest.org. But SpokeFest is just one of 18 bicycling events scheduled in the region during September. Kootenai River Ride, Sept. 13: Ride 16, 60 or 100 kilometers near Kootenai River out of Bonners Ferry. Blazing Saddles Bike Ride, Sept. 20: Combines 20-, 40-, 62- and 100-mile cycling routes out of Colville with the Northwest International Chili Cook-Off and beer garden. Valleyfest Trail Ride, Sept. 21: Family bike tour on the Centennial Trail starting at noon with other festivities at Mirabeau Point Park. Choice of 6.8-, 8.8- and 15.6-mile routes. Coeur d’Fondo, Sept. 27: The third annual Gran Fondo-style timed event begins and ends in Coeur d’Alene with competitive and noncompetitive options. Choice of five distances: 15, 37, 47, 85 or 108 miles. Details and links for these and other rides within 300 miles of Spokane are in The Spokesman-Review’s 2014 Northwest Bicycling Events Calendar under “Calendars” at spokesman.com/outdoors. TRAILS – The Friends of the Bluff are inviting the public to a meeting to discuss future efforts to maintain nearly 30 miles of trails on the South Hill below High Drive from Hatch Road area north to 14th Avenue. The group will meet Wednesday, 6 p.m., at Bernard and High Drive. Bring a water bottle and a folding chair for the meeting and be prepared to walk down and look at some of the most difficult sections of trail. Mike Brixey from International Mountain Biking Association will offer expertise. 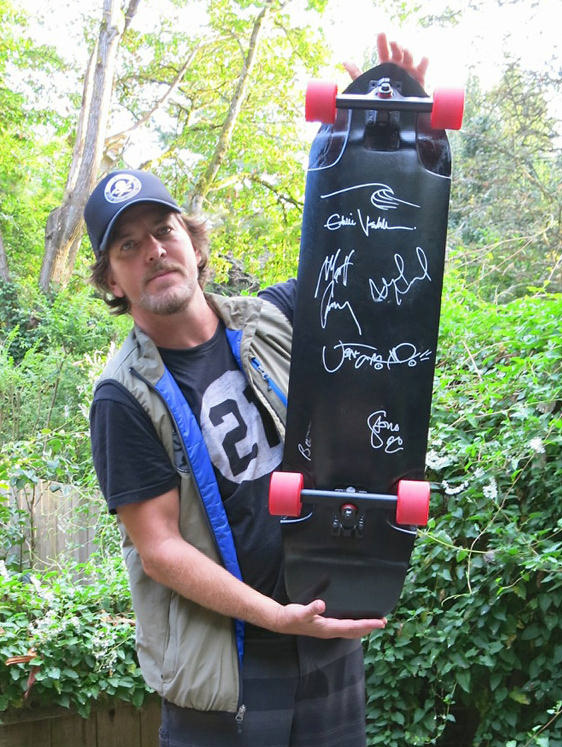 TRAILS – Eddie Vedder and his Pearl Jam bandmates are rallying to support the 25-mile Ferry County Rail Trail in northeastern Washington by signing and donating a longboard to an online auction that’s underway on eBay. Going into the weekend, bids exceeded $2,300. The auction is set to close today at 7:24 p.m.
Funds will be used by Ferry County Rail Trail Partners to enhance the surface of the abandoned railway that connects four towns, two school complexes and borders miles of waterfront, including Curlew Lake and the Kettle River. Auction details online at FerryCountyRailTrail.com.